California is committed to dramatically reducing its contribution to global climate change. The state’s goal of reducing greenhouse gas emissions 40% below 1990 levels by 2030 will require collaboration among cities, agencies, and regional government. As 25% of the state’s population, the Los Angeles region will play an essential role. Scientists expect the impacts of climate change to include increased heat, decreased water reliability, and rising sea levels to increase through midcentury. Meeting these challenges will require transformation in energy, transportation and land use, water, public health, and ocean and coastal management. 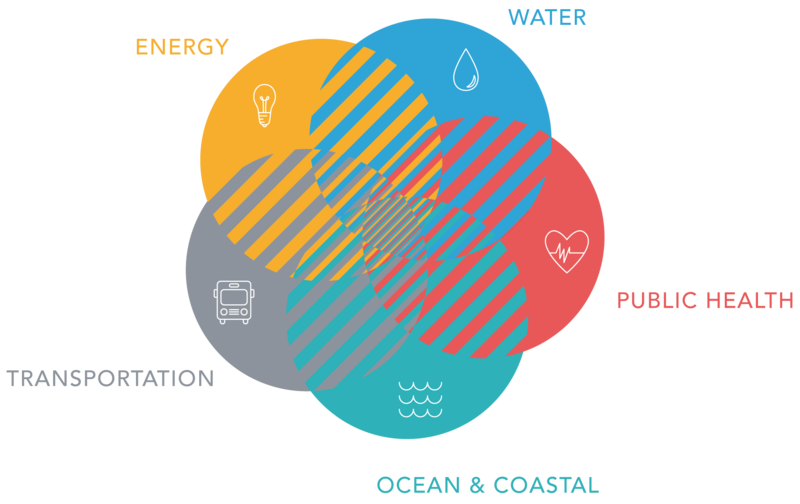 A Greater LA: A Framework for Climate Action lays out a set of recommendations in each of these areas to maximize regional benefits and help California achieve its ambitious goals. LA is famous for its climate. People flock to the region from across the world because of its stunning, natural beauty and rich, diverse cultural opportunities. As climate impacts increase, we can work together to protect our region. Climate change is driven by human emissions of greenhouse gases, and we are already experiencing its effects. Even if global greenhouse gas emissions were drastically reduced, the climate would continue to change through midcentury. However, reducing greenhouse gas emissions now will help avoid the most severe impacts of climate change predicted to occur after midcentury. In Los Angeles, anticipated climate change impacts include hotter temperatures and more severe heat waves, threats to our water supply, larger and more frequent wildfires, and rising sea levels. Higher temperatures will contribute to more smog, increase the incidence of vector-borne diseases, lead to electricity outages, and affect agricultural crops. This report explores five sectors and shows how they are interconnected.